I have officially started the process of moving my blog, The Class Nerd, from Squarespace to Micro.blog. I have struggled with squarespace for a long time as an iOS only user, and as Micro.blog has matured as a platform, it has become more and more powerful. That, combined with the ability for me to post content directly to Micro.blog from Drafts 5, has let me to moving. 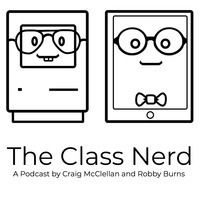 I currently have @theclassnerd set up here on Micro.blog, and I have just moved the domain over. If you are subscribed to The Class Nerd via RSS, you’ll need to use the new feed (or JSON feed). If you follow me on Micro.blog and want to continue to see my posts about education technology, you should follow @theclassnerd. All posts via The Class Nerd will also go to The Class Nerd twitter account. CraigMcClellan.com will continue as my personal blog covering everything from Apple to foster care to Star Wars. All posts about how I get my work done as a teacher using iOS will be on The Class Nerd. Follow along even if you’re not a teacher though. Hopefully it’s still useful. I have a lot of stuff planned for The Class Nerd in the next few weeks, and having it hosted here on Micro.blog enables a lot of that. I’m excited for what the future holds.